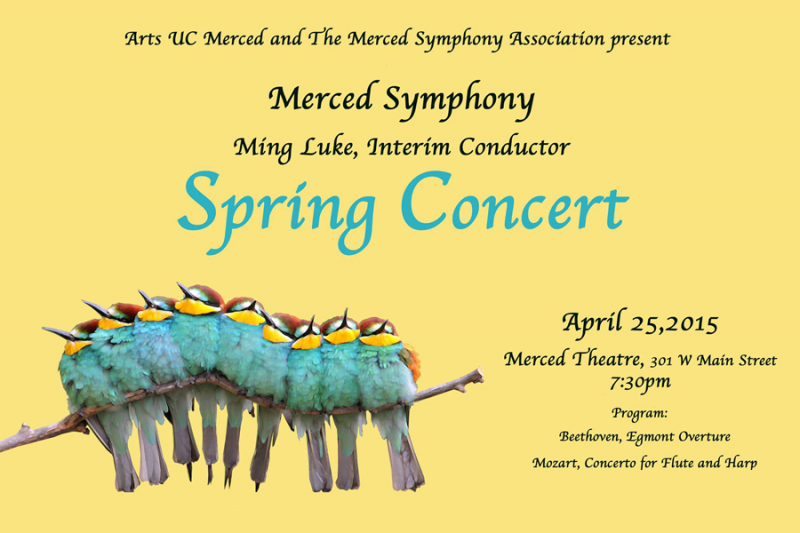 Arts UC Merced Presents is a proud to sponsor of the Merced Symphony’s season finale concert on Saturday, April 25, 2015 at 7:30 pm at the Art Kamangar Center in the Merced Theatre. Interim Conductor, Ming Luke, will lead the orchestra in a program that includes a beautiful mix of classical composers including Beethoven, Mozart and Brahms. The Concerto for Harp and Flute by Amadeus Mozart will feature Laurel Zucker on flute along with Madeline Olson on harp. The concert also includes Egmont Overture by Ludwig von Beethoven, and Symphony No. 4 by Johannes Brahms. Tickets are $39 for adults and $14 for students under 25 with ID. Tickets can be purchased at the Merced Theatre box office at 301 W. Main St. or online at www.mercedtheatre.org. Call 209-381-0100 for more information.